Twenty-three years after Samuel Huntington’s popular book “The Clash of Civilizations” was published and aroused calls for dialogue between different civilizations, it is still as relevant as ever in the current era of regional confrontations and inter-religious mistrust. In this context, and through an initiative with the United Nations Educational, Scientific and Cultural Organization (UNESCO) and the Chinese Ministry of Education, the first Asia-Pacific Youth Dialogue opened on Sept. 21, the International Day of Peace, in the southwestern city of Chengdu, Sichuan Province. Around 200 young delegates from 46 countries of the Asia-Pacific region gathered to discuss how to build a nexus between Asia Pacific civilizations, cultures, social cohesion, respect for diversity and peace building, as well as engaging with the youth as agents of change and custodians of the future regionally and internationally. The initiative coincides with the call of the country’s policymakers to boost regional cooperation and development as President Xi Jinping proposed in a speech last year at the Boao Forum for Asia (BFA). This, he said, could act as a platform to enhance interactions among young people, local communities and the media and to form a network of cooperation. She called for young people to act on the domestic and international problems they face, citing the fact that British youth might be the hardest hit by the Brexit scenario due to their inaction before and during the referendum. Robert H. Xiao, CEO of Perfect World Co., Ltd., China’s online gaming giant and sponsor of the event, highlighted three keywords, i.e. communication, hope and responsibility, as his expectations for the young people. When asked about his expectation for the event, Andrew Lesa, a youth delegate and also a diplomat from New Zealand told China.org.cn he wanted to see actions in earnest following the event. The three-day event is envisioned as a dynamic and participatory event utilizing a combination of plenary lectures and workshops organized both thematically and sub-regionally, and fun activities to provide learning and networking opportunities for the youth. 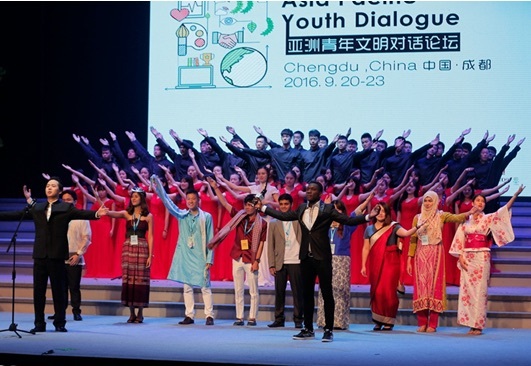 According to the organizer, the initiative is a follow-up to discussions on Young Global Citizens for a Sustainable Planet in 2015 and leads up to the 2017 Asian Civilization Dialogue Forum in China.